Share this site via e-mail and inform your friends about current SLF topics! 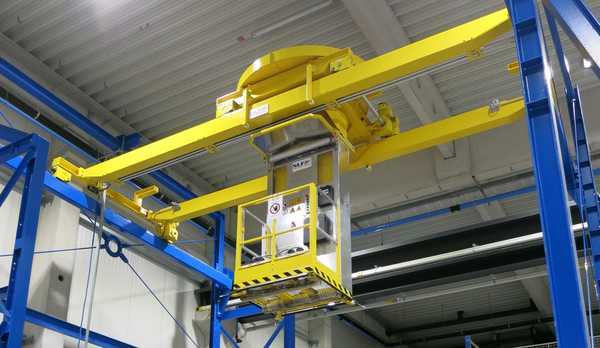 Depending on the type, our vertical-telescope-lifting platforms are suitable for washing and preparation booths as well as blasting and zinc spraying booths and painting units. Due to a turning range of almost 360° in combination with the telescopic lift, the lengthwise and crosswise drive, the large platform cage reaches virtually every work position in the booth.An integrated gear brake motor provides accurate positioning as well as comfortable and with that ergonomic work conditions.Additionally, the travelling drives are equipped with frequency converters to ensure smooth starting and stopping.Depending on the area of application the lifting platform is protected against dust, splash water or explosions. Unlike similar vertical-telescope-lifting platforms, this platform is distinguished by it's compact design because the platform cage is positioned on the side of the telescopic axis, not underneath it.With this solution in the area of lifting platforms we save valuable space, which enables the passage above tall components. By entering my email adress and clicking the "Subscribe to newsletter" button I agree that SLF Oberflächentechnik GmbH regularly sends information regarding the following topics by e-mail: pre-treatment systems, airblasting systems, paint spraying systems, conveyor technique and sales and marketing news. I can revoke my consent at any time towards SLF Oberflächentechnik GmbH.